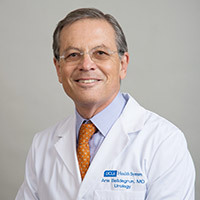 UCLA's Institute for Urologic Oncology (IUO) is poised to become the driving force for multi-disciplinary patient care and global research, resulting in the most comprehensive program of its kind treating patients with all stages of a given urologic cancer type. The new home of the IUO, in the Edie and Lew Wasserman Building at the David Geffen School of Medicine at UCLA, enables physicians, surgeons and researchers from multiple departments to come together to leverage their expertise and change the course of therapeutic developments. We value your partnership in this crucial mission. Philanthropic support fuels innovative research, bringing new hope to patients with complex urologic oncology diseases. Each gift, regardless of amount, moves IUO scientists and researchers one step closer to translating laboratory findings from bench to bedside more rapidly and effectively, ultimately saving lives. While many such pursuits are federally funded, there exists a critical gap between identifying a need and attracting grant support for it. Philanthropy fills that gap and is vital to the success of this promising work. We are grateful for your partnership. Thank you.